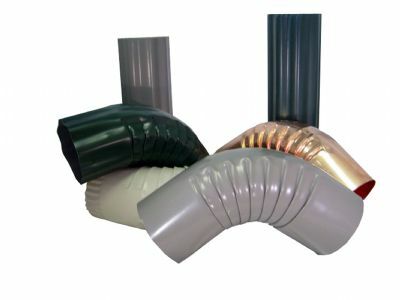 Chris Industries offers custom lengths in downspout and gutter. 1. Installation time decreases because there is no need to cut downspouts that are too long. 2. Installation time decreases because there is no need to connect downspouts that aren't long enough. This also reduces the need for rivets and screws. 3. There are pieces of cut off downspout left over that were paid for and are now being thrown away! What is PVDF and Kynar / Hylar? Kynar 599 or Hylar 5000 is a sheet metal coating that is applied to either G-90 galvanized sheet and 3105-h14 aluminum sheet. PVDF, or Polyvinylidene Fluoride, is a highly non-reactive and pure thermoplastic fluoropolymer. Although it is called a paint, PVDF is a actually specialty plastic material (related to Teflon) in the fluoropolymer family; it is used generally in applications requiring the highest purity, strength, and resistance to solvents, acids, bases and heat and low smoke generation during a fire event. This is the type of metal used for most metal commercial applications (see pictures below). Coping, Flashing, Custom Fabrication and more!